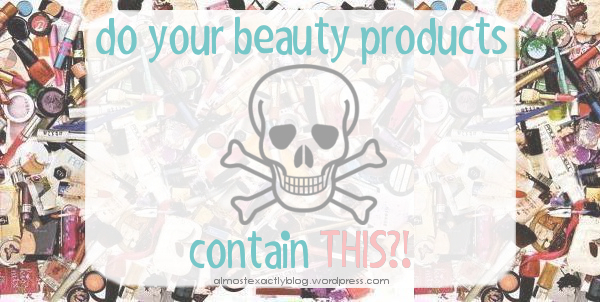 do your beauty products contain THIS?! 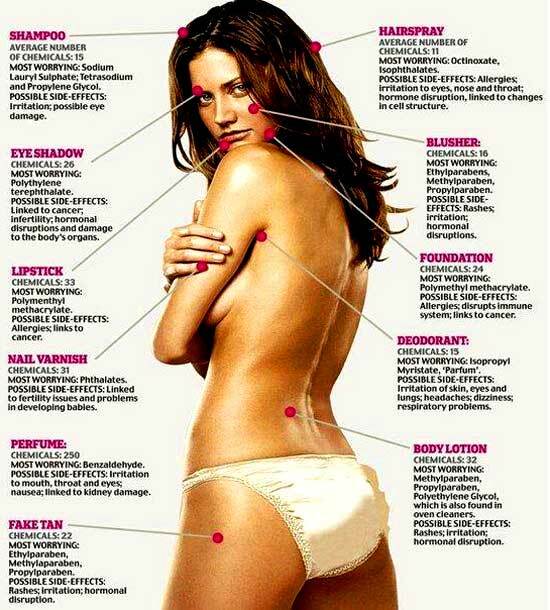 let me just lay a fun fact on you (that’s not really fun at all)… the FDA doesn’t regulate lead levels in cosmetics. i’m not kidding. does that not bother you?!!? another not-fun fact. you know the sodium laureth sulfate in your shampoo that makes it all sudsy? our bodies aren’t designed to remove those toxins from our tissues once they are absorbed. you know what that means? they remain in our tissues, potentially doing harm, for a very long time. SLS has been found in brain, eye and liver tissues of cadavers of people who quit using sulfates as many as fifteen years prior to death. WHAAAAT?! right! 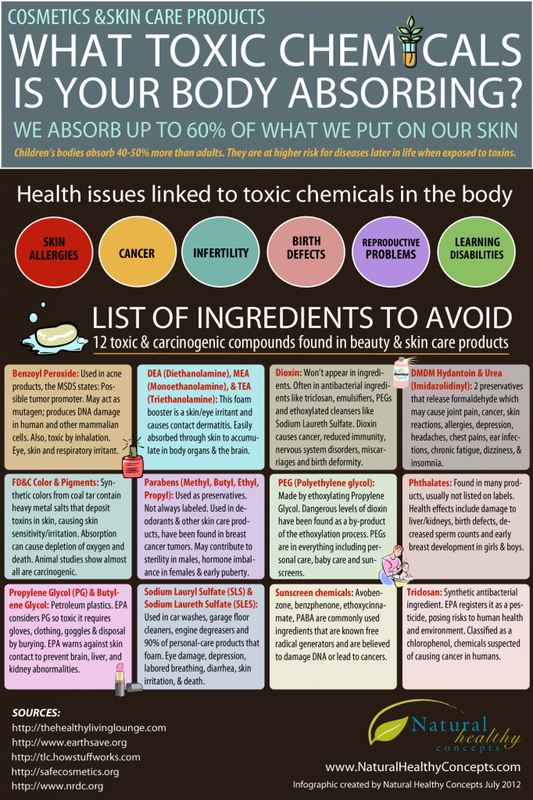 and you wonder why the hell i completely gave up all chemicals in my beauty routine. you’re getting small amounts, you say? even in small amounts, these ingredients add up over the years. you also have to consider it’s not just what’s in your makeup. it could be your shampoo, lotion, perfume, etc. AND if these are in multiple products of yours, just think of the multiple exposures you’re getting… times the years…. YIKES! i don’t understand how this isn’t more terrifying to people. anywho, i’ve compiled a small list of some of the biggest makeup toxicity offenders below. i’m a firm believer in being an educated consumer and a healthier human 🙂 if you are too, you can check out this awesome site & awesome woman! please, if you have anything… any type of product… with any of these ingredients, please do your body a favor and throw them AWAY! – mercury: (check your mascara) nervous system damage, do we really have to talk about mercury being bad? or lead for that matter? ……..and do you like to wear lipstick? ladies, please note mac & burt’s bees are NOT on that safe companies list. i’ve never understood the hype behind their products anyway. what steps have YOU taken to be a healthier you, inside & out?! 😦 it is soooooo difficult to find stuff that’s not stuffed with crap. I went out today to see if I found a good nourishing oil and I bought something that turned out to be toxic again… I live in southamerica have hard-ish water and low porosity, thin hair. I’m considering trying the hibiscus shampoo, since I have one and it’s packed with flowers all year round. If not, co-washing with acv… it’s the last thing I can think of, ’cause the bacingsoda is too strong for me. Any advice? Oh, I also found coconut soap… anybody use that stuff? If you can get living libations products I would go for them they are amazing and pure. Have you found any good products yet. I may be able to help you! ! What about burt’s bees? I’ve been using it because of natural ingrediants but is it ok? Hi! Thanks so much for posting this! I’m a cosmologist student and what you’ve said in this article about many beauty products is true. I’ve been planning on going the natural route with my hair. I think this really solidified again how much I need to do it; especially for me to teach it to my clients and to help their hair routines. thanks elisabeth! that’s great to hear!